CADET (CApture and DE-orbiting Technologies) R&D project has the objective to perform preliminary development of enabling technologies required for Active Debris Removal from LEO orbits. The project focuses in particular in-space capture concepts for large space debris, such as upper stages of elderly launchers or decommissioned satellites. For these, a non-collaborative rendez-vous and capture procedure, to be performed by a robotic spacecraft (namely “chaser”), is required. 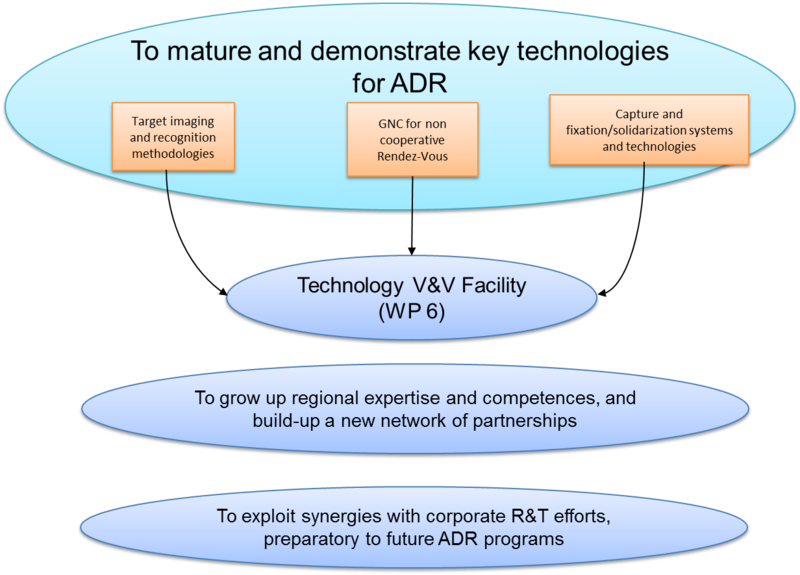 For such technologies, current level of development – at least on the national scenario – is TRL 2 and it is planned to reach of TRL 4 through the development of an integrated demonstrator and the associated test setup to be adopted for functional validation. CADET project started in January 2013; it is co-funded by Regione Piemonte according to call for proposal: POR FESR 2007/2013 – linea di attività I.1.1. “Piattaforme innovative” – AEROSPAZIO FASE II. Active debris removal: why we need it? 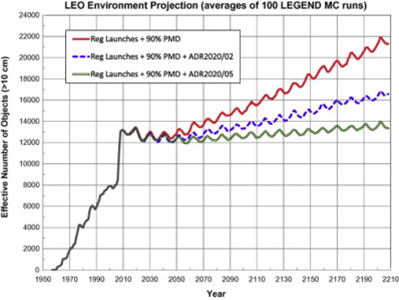 The challenge of removal of large pieces of space debris in Low Earth Orbits, such as spent launcher upper stages or satellites having reached their end of lifetime, is already well-known and recognized by the most important space players, both institutional and industrial, as a necessary step to be overcome in order to make appreciable progresses towards a cleaner and safer Space environment. This is a mandatory condition for making future space-flight activities safe and feasible in terms of derived risks. Recent studies demonstrated that capability to remove existing space debris, over preventing the creation of new ones (for instance providing newly launched assets with the so called “post mission disposal” capability – PMD), is necessary to invert growing trend in number of debris that lies in orbits around Earth. This is shown by the following figure, which shows that a minimum of ten large debris (> 500 kg) removed is required for stabilize the trend.